Looking for a fun activity to play with the kids while touring a new city or while out running errands in your own city? 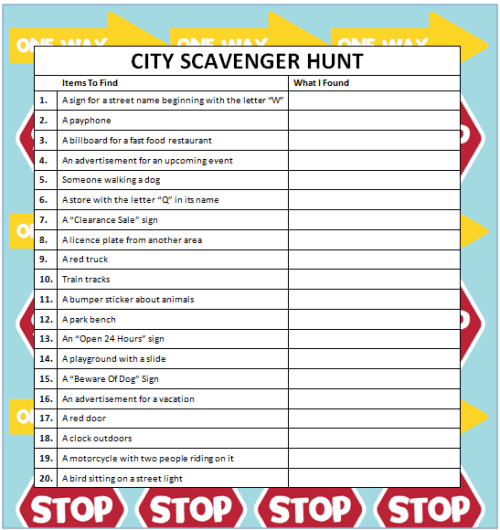 Then try this fun (and free printable) idea for City Scavenger Hunts. You can either provide your child with a kid-friendly digital camera or just have them point the findings out to you as they find them. This is great for kids of all ages and can be played over again when you visit a new area of the city. Did you know that we have loads of free printable games? It’s true! Head on over to our Free Printable Games page for a listing of all of them. We have word searches, charades, scavenger hunts, BINGO cards and more! We’d also love to see you in our communities on Facebook, Twitter and Pinterest. We’re always adding new & fun ideas to enjoy with your family.